Win a $100 Gift Certificate to John Barleycorn! Congratulations to Alissa Robinson on winning our thirty eighth High Five Giveaway and thank you to all who entered! 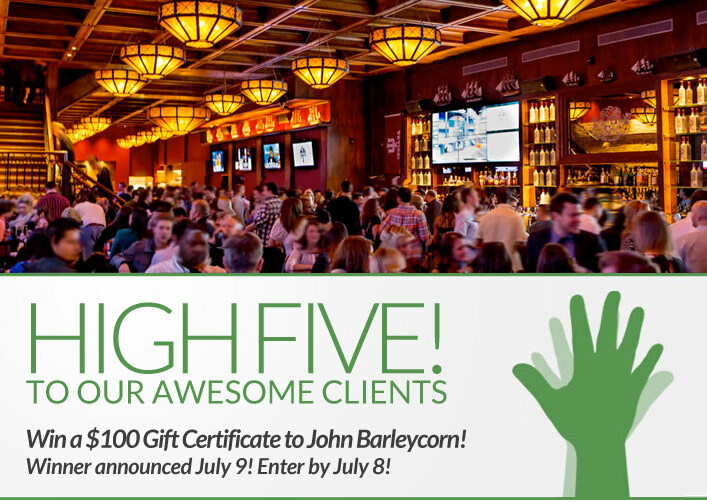 Our next giveaway is for a $100 gift certificate to John Barleycorn. John Barleycorn offers something for everyone from a conversation-friendly business lunch to weekend brunch with the family to a private event in the atrium with all the amenities. Expect a lineup of gourmet burgers and American fare with a full bar specializing in craft beers and handcrafted cocktails. Sports fans will appreciate the 80 HDTVs and five video panel walls showing the day’s top games and acclaimed local and national DJs perform every weekend on the second floor. John Barleycorn has four locations in Chicago, with one in River North at 149 West Kinzie. Call them at 773-348-8899 or visit their website at www.johnbarleycorn.com. What is a hot wedding trend this season? Now, just add a comment to this post with the right answer to be eligible to win! The winner will be announced on Tuesday, July 9. Entries must be received by midnight on Monday, July 8. Braids : ) Also Accessories! Braids and Accessories – love it! Braids are trending this year. Whether it be tight, loose or a side braid, it’s elegant and fun all rolled up in one. the ever beautiful wedding braid…. Braids:Side braids, braided up dos, or even half-back braided styles. Accessories: pins, combs, lace, hair bands, and flowers.